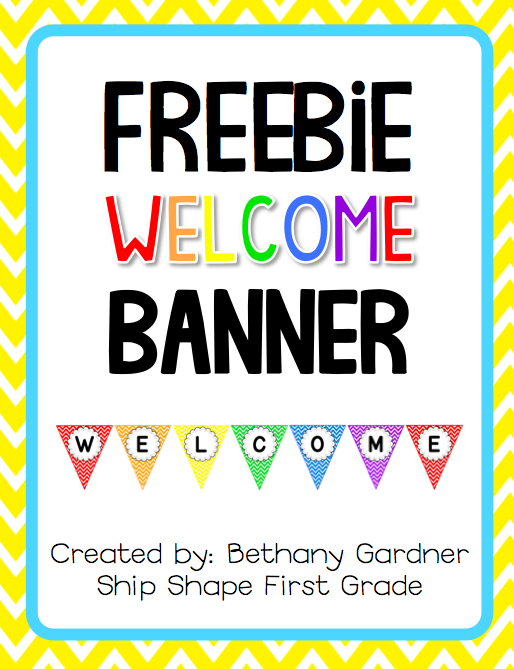 Ship Shape Elementary: Free Chevron Banner! My life is a large heap of boxes. This will be our fourth move in our two and a half years of being married! However, it will be the first time we haven't moved over CHRISTMAS so I am pretty thrilled about it. My laptop is going to get packed up for a few days so I wanted to share a quick freebie with you while I have the chance! This cheery chevron banner will brighten your classroom and help your little ones feel welcomed! Click below or here to grab yours for FREE! Enjoy! Don't forget to follow me on Facebook and Pinterest! Love this adorable banner! Just found you through Melonheadz giveaway! Your blog is too cute! Good luck with the move. I, too, found you through Melonheadz! Happy Pioneer Day! My 25 year old daughter's name is Bethany so I'm always happy to find another Bethany in the world!